This project posed a few obstacles. 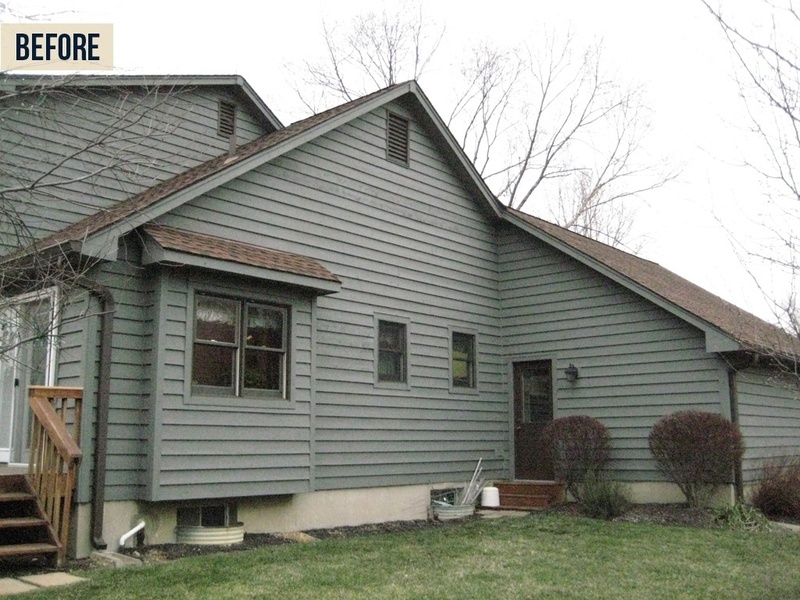 First, to create the seemless addition the homeowners were looking for, the exterior roof lines needed to be matched, as well as the original interior and exterior finishes. The addition could also not infringe on an existing rear garage entrance. Accounting for rain water drainage in the flood-prone back yard was another element of the project. Inside, providing more convenience for entertaining in the expanded space was a leading concern for design. 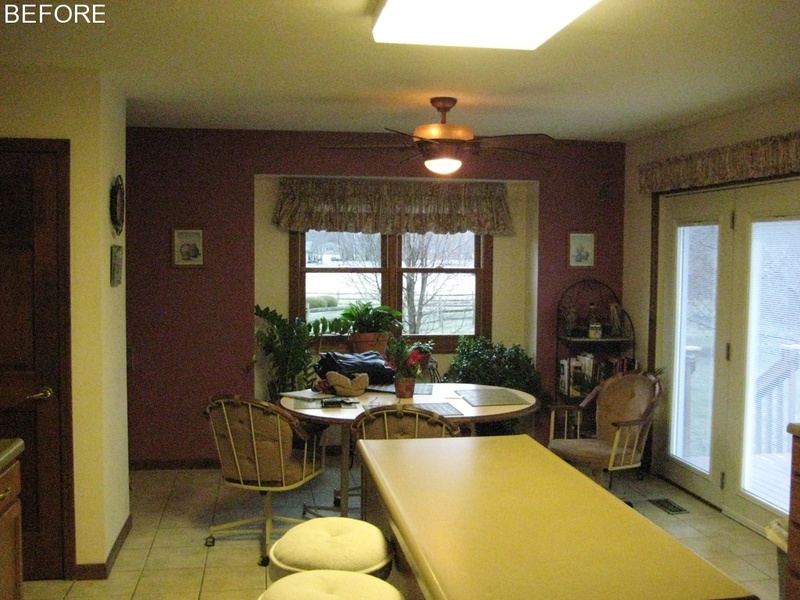 Problem: The eat-in kitchen was too small and not functional for entertaining, and the space felt cramped and dark. Solution: A 9 foot expansion off the kitchen created the space necessary to go from a “kitchen table” to a dedicated Breakfast Room. 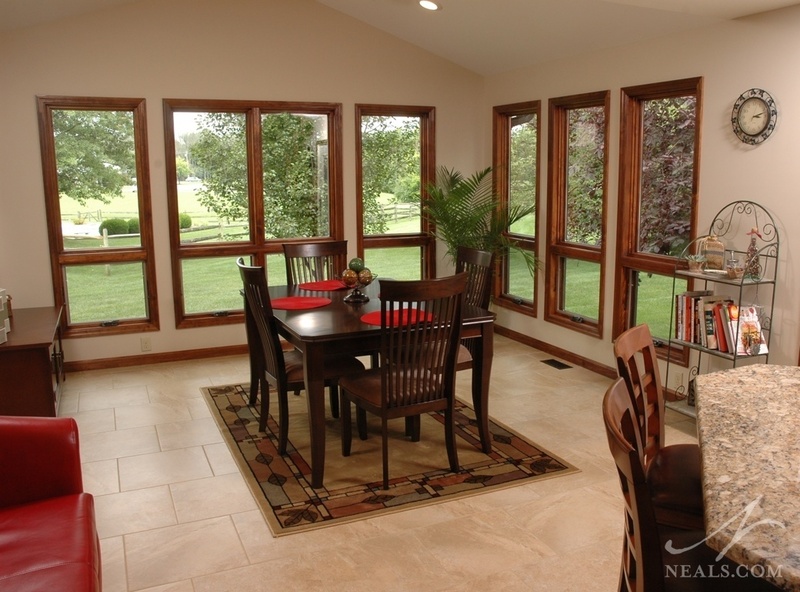 Sets of tall windows on the two longer exterior walls provide expansive views to the side and back yards. A vaulted ceiling in the addition increases the spacial atmosphere. Problem: The narrow laundry corridor was ill-suited to the homeowner’s needs, lacking functional floor space, storage and work surfaces. Solution: As part of the entire addition, a 4 foot bumpout was included at the end of the existing laundry. 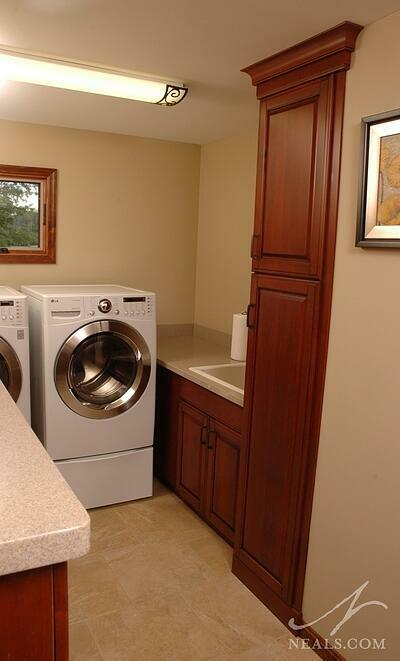 This change accommodated the movement of the recently installed front loading washer and dryer from the narrow walkway to the end of the room, drastically improving usable floor space. 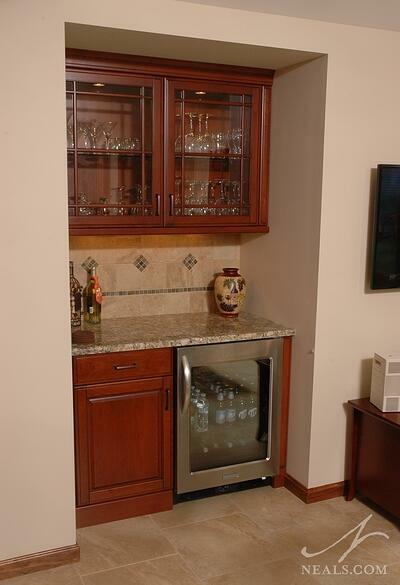 Cabinets added to both sides of the room provide storage and well as counterspace. a new sink rounds out the space. Problem: In combination with the eat-in portion of the space, the kitchen, though practical in layout, was too small for entertaining, and lacked any style to compliment the home. Solution: With the table moved into the new Breakfast Room, the island was enlarged and stretched into the existing space. Storage was added, and a small 2-person eating area was included. 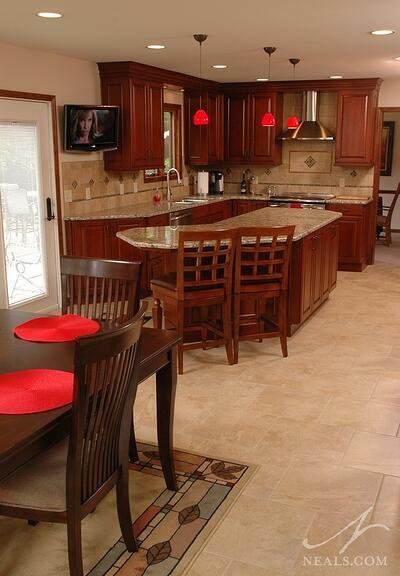 Finishes and flooring were updated throughout, pulling the entire, longer room stylistically together. A built-in desk near the kitchen table took advantage of a niche, but had turned into a cluttered space that only increased the kitchen’s cramped feeling. In the new space, a similar idea was utilized to provide space for a new bar and beverage center. 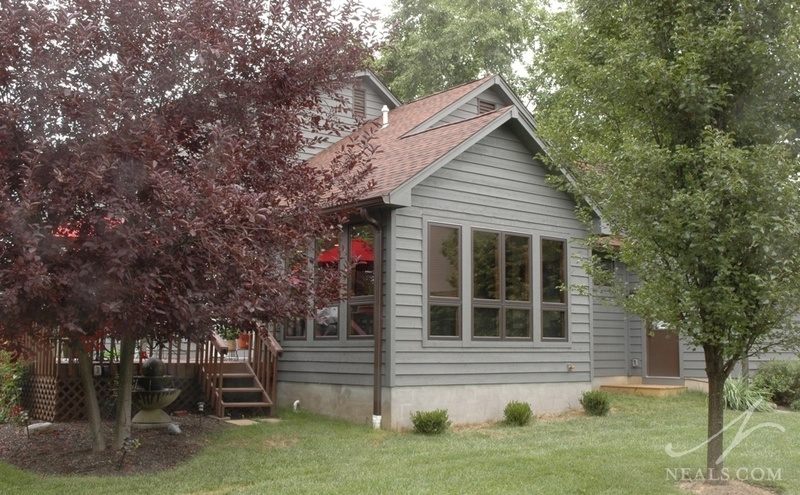 resulting U-shape in the side elevation of the house provides architectural interest. A new crawlspace under the Breakfast Room, where a new sump pump was installed, and re-worked downspouts on either side of the addition will better control backyard flooding.